Flat-Earthers believe photos like this one, which was taken by NOAA’s Deep Space Climate Observatory (DSCOVR) spacecraft, have been faked or doctored. This has to be the most absurd rap battle of all time. On Monday evening (Jan. 25), Grammy-nominated rapper B.o.B. called out famous astrophysicist Neil deGrasse Tyson in a new song proclaiming that — satellite photos, circumnavigation of the globe and all other evidence be damned — the Earth is flat. The title apparently refers to the shape of the horizon, as seen by B.o.B. Throughout Sunday (Jan. 24) and Monday, the rapper, whose real name is Bobby Ray Simmons Jr., tweeted a number of photos that show a flat horizon, claiming such images are evidence of a flat Earth. "Once you go flat, you never go back," B.o.B. tweeted Monday, via his @bobatl account. "I'm going up against the greatest liars in history ... you've been tremendously deceived," he said in another tweet Monday. Then: "No I'm not crazy, Yes I'm feeling fine, no I'm not doing anything stronger than weed, am I doing this to promote my music .. No..."
Tyson — the director of the American Museum of Natural History's Hayden Planetarium, and one of the most prominent science communicators alive today — responded to B.o.B. 's claims via Twitter Monday. The scientist pointed out, among other things, that people 1.5 degrees or more south of the equator can't see the North Star, Polaris (because Earth's curvature blocks their view). "‪@bobatl‪ Duude — to be clear: Being five centuries regressed in your reasoning doesn't mean we all can't still like your music," Tyson said via his Twitter account, @neiltyson, on Monday morning. Such ripostes seem to have inspired, or at least strongly influenced, B.o.B. 's new song, which the rapper released on SoundCloud Monday evening. But Tyson hit back today (Jan. 26), tweeting out a link to a new track that makes the case for a spherical Earth. ‪"@bobatl‪ As an astrophysicist I don't rap, but I know people who do. This one has [my] back," Tyson tweeted today. 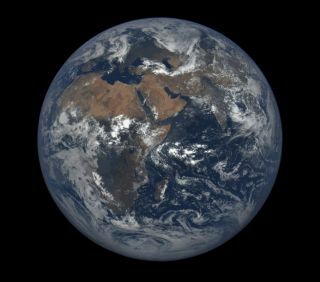 The spherical-Earth song, by a rapper somewhat confusingly named Tyson, is called "Flat to Fact." "He learned the game from Carl Sagan — you can never check him," the rapper Tyson says of astrophysicist Tyson on the track, which also features the scientist reading some of his Twitter responses to B.o.b. "You say the Earth is flat, and then you try to disrespect him. I'm bringing facts to combat a silly theory, because B.o.B. has got to know the planet is a sphere, chief." You can listen to "Flatline" here: https://soundcloud.com/bobatl/bob-flatline-feat-neil-tyson, and "Flat to Fact" here: https://soundcloud.com/drtyson/flat-to-fact.